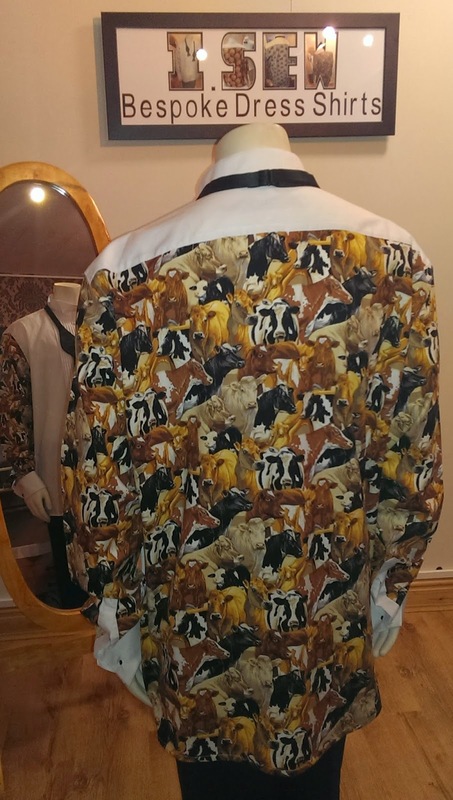 A Gentleman's Luxuries: I.Sew, masters of the fancy back dress shirt! Fancy back shirts is something I have no experience with and only a few months ago I hadn't even heard of the concept. It was by following @I_SEW on Twitter and consequently having a look at the I.Sew website, I was first introduced to fancy back shirts. As with many other things new to me, I would like learn more about it and I thought that there could be other people curious about this as well. So, I invited De-anne from I.Sew to write a post for the blog, to tell us about fancy back shirts, herself and the company. I am very pleased to say that my request was accepted, so now I'll give the word to De-anne. Firstly I would like to say thank you for inviting me to write this article. My name is De-anne and one year ago I was working alongside my 2nd husband Mark, running a successful gardening business which I had done for 6 years. Prior to this I was a post person but all the time I did clothing alterations from home. In the beginning, upon leaving school, I was trained by Marks & Spencer’s as a machinist, this was back in the days when M&S made their own quality clothing in the UK. I met my first husband, a soldier, quite young and then embarked upon the life as a soldiers wife. It was not long before I gained myself a position on camp as an army tailor doing alterations, medal mounting, ceremonial dress etc. As is the way within the army, I moved from camp to camp and almost immediately I found myself head tailor at each posting. During this time I was asked to fancy back an odd shirt for Mess functions. About this time last year, finding it harder to do the strenuous work in the gardens and with not enough work doing clothing alterations from passing trade at home, as I live out in the sticks, Mark suggested I look into taking a shop in our local market town of Spilsby in Lincolnshire. A daunting task as neither of us has much shop experience. Thus I.Sew was born. A suitable premises was found and lease secured. Now I had a shop, I knew I would be doing the clothing alterations, but would that be enough to give me an income. I have been lucky as a haberdashery shop was closing down and I managed to take on the dry cleaning agency that they had been running. Still I was concerned that doing clothing alterations would not be enough to make my rent, so I started looking into alternative things I could do. Then one night while at an RAF ball, my friend said to me “have you seen my mate’s shirt?” His mate pulled down one shoulder to reveal a pattern and I said, “I used to make those”. Marks reply, “Why aren't you making them now?” Thus, I.Sew Fancy back shirts came to fruition. Now I have to say that when you give my husband an idea, it is amazing how far he can go with it and fancy back shirts gave him ideas. Passion is a good thing and as we attend quite a few black tie events, loving the sartorial elegance that it empowers, we became very passionate about my fancy back shirts. 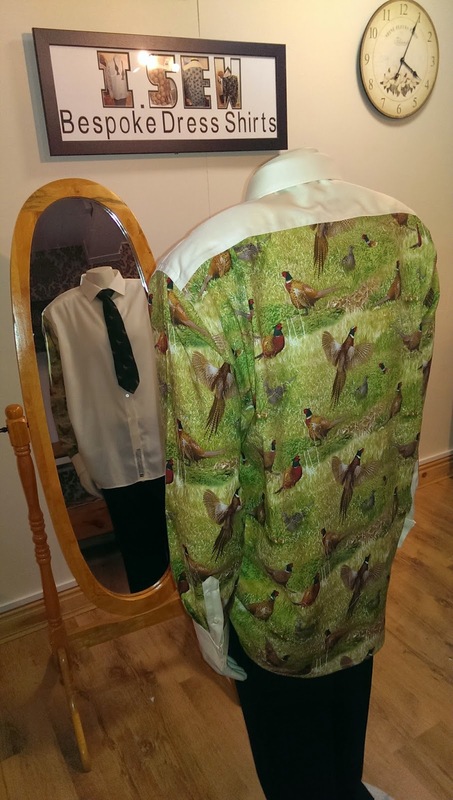 The idea: a fancy back shirt, a formal or business shirt, or blouse having its back, or back and sleeves, removed and replaced with a pattern and having the original cuffs replaced, all in such a way that when a jacket is worn it cannot be seen. That is simple enough but what patterns do I choose to make? It was then that we hit a bit of a wall. We could buy and make shirts which would not sell, costing me money which I could ill afford. We also took into account that if a lady goes out and meets another guest wearing the same dress, she is not happy. The same would be said for a man buying a fancy back shirt. So, in order to make a shirt, the client would have to choose his own pattern and once made, I could not sell the same pattern to anyone in the surrounding area of where the first shirt was sold to and so, two shirts with the same pattern shall never meet. A good idea, BUT this idea is not just good it’s great! Thinking about it, we realised that I am offering a bespoke service, making a customised unique shirt, one I may not ever make again. So, each shirt has an authenticity certificate so you know its limited edition number. 1-of-1 is the original and to date we have not made a second shirt using the same fabric. So, where do we find the fabric? To be honest, we have used eBay which has a vast amount of patterned cotton fabric. We have 3 or 4 other trusted sites with good stocks, but in nearly a year of trading I have come to find that fabrics are only available for a short period and then it is gone. If you like a fabric today, in a month's time you may not be able to get hold of it. The fabric I used for one of the first shirts I made is now unavailable. 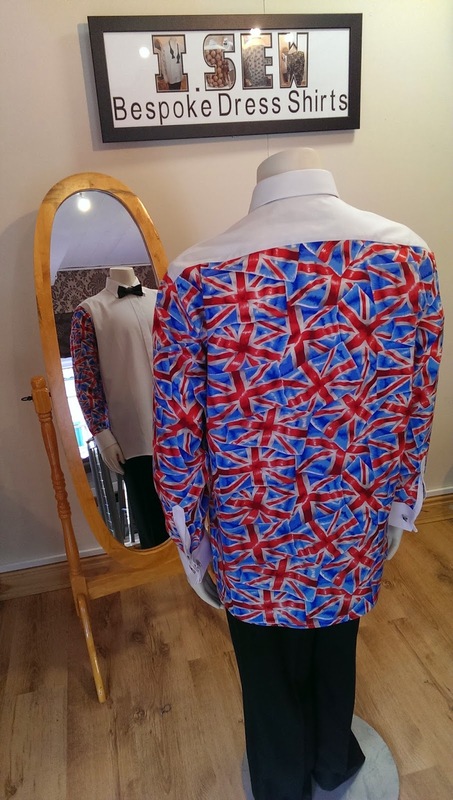 So, we have now come to realise that the fancy back shirts I produce can be very unique. I then offered Marks services in finding a pattern if the client didn't have the time or will to search for it themselves, which raised another hurdle as we kept getting asked for fabric patterns that he could not find. Mark is, as I said, a resourceful man and it wasn't long before he came to me and said he had found a company in the USA who would print short runs of fabric and he could design his own pattern. Having put it to the test, we have now produced our first self designed fabric for a client: “Lincolnshire flags”. More to follow I’m sure. So, to recap. So far you have a unique fancy back shirt with its authenticity certificate with a swatch of the patterned fabric on it. This is where most would expect it to stop, but Mark and I are passionate about our shirts so we wanted to offer more. Thus, each shirt comes in its own gift box which includes a hanger, dustcover and matching pocket square. Also, because each white shirt has a coloured back and sleeves, I undertake several trials on the care of your shirt and I include my own detailed care instructions and a box of colour catching sheets that stop colours running into the white. We can also source matching cuff links for most patterned fabrics. In conclusion, after months of careful thought, deliberation and planning, I can now offer a service that is unique, bespoke and top quality. Now I just need to tell the world. Please help spread the word via social media! Thank you very much De-anne for telling us your story and for introducing us to fancy back shirts and you relatively new business. I hope your business will be successful and I wish you all the best for the future. De-anne and Mark have made some videos which are available on you tube and I've embedded one of them below. This one is called "The reveal". Here are the links to two other you tube videos which I also thought I would embed into this post but, for some reason unknown to me, the technology wouldn't have it. Are you still making them? I can't access your website or Facebook page? ?